Vehicle sales in China, the world’s largest auto market, rose 4.3 per cent in 2012 to 19.3m, a modest increase over the previous year’s pace, according to the China Association of Automobile Manufacturers. But while last year’s sales growth surpassed that of 2011, when sales rose only 2.5 per cent, it was still far below the stratospheric levels of 2009 and 2010 when vehicle sales rose 46 and 32 per cent respectively. Sales were affected over the year by a broad slowdown in China’s economy coupled with traffic restrictions imposed by several cities and lower sales of Japanese cars due to Sino-Japanese political tensions. CAAM is predicting a slightly rosier picture for 2013, forecasting a 7 per cent rise in total vehicle sales for the year. It expects passenger car sales to increase 8.5 per cent with commercial vehicle sales expanding only 1 per cent. Official figures for wholesale deliveries to dealers, announced on Friday by CAAM, showed that sales began to recover near the end of the year. December vehicle sales rose 7.1 per cent from a year earlier, slowing from November’s 8.2 per cent pace but extending a turnround from a fall of 1.7 per cent in September. That came as sales of Japanese carmakers in China also began to recover, after tumbling in September and October following widespread street demonstrations triggered by Tokyo’s de facto nationalisation of disputed islands in the South China Sea. Japanese carmakers in China told Chinese media this week that they had ramped up production toward the end of the year. China is expected to produce more cars than Europe in 2013 for the first time, a milestone in the country’s industrial history. Bill Russo, head of Synergistics auto consultancy in Beijing, said he expected annual car sales growth of “between 5 and 8 per cent over the next decade as a function of the central government’s desire for stable and more sustainable economic growth, the phasing out of auto subsidies, and to a lesser extent the licence plate restrictions in cities like Shanghai and Beijing”. But traffic congestion and licence plate restrictions imposed by increasingly gridlocked municipalities will keep downward pressure on sales, said Jia Xinguang, researcher with the Chinese Automotive Industry Development Research Institute. “The government will continue to impose restrictions on car purchasing and traffic controls in more cities as long as traffic congestion is still severe,” said Mr Jia. Despite slower growth, China remains the top investment destination for global automakers, attracted by significant domestic demand and export opportunities, according to KPMG’s annual Global Automotive Executive Survey published this week. Of those polled, 70 per cent of respondents said China was their top choice for investment, ahead of India at 63 per cent, Russia at 54 per cent and Brazil at 48 per cent. 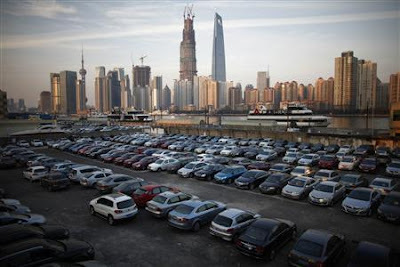 A parking lot is seen along the Huangpu River near the financial district of Pudong in Shanghai, in this file picture taken December 12, 2012. Automakers in China are bracing for another year of tepid single-digit growth in 2013, weighed down by sluggish demand for Japanese cars amid a diplomatic row between the two regional neighbours and government measures intended to restrict traffic in bigger cities. Automakers in China are bracing for another year of tepid single-digit growth in 2013, weighed down by sluggish demand for Japanese cars amid a diplomatic row between the two regional neighbors and government measures intended to restrict traffic in bigger cities. Executives at local and foreign carmakers in China predict the overall vehicle market will grow 5 to 10 percent this year, roughly in line with 2012, when demand was hit by a slowing economy and rising fuel costs. Japanese carmakers will likely continue to struggle in 2013 after they saw their China sales plunge by about half in 2012 after anti-Japanese protests and boycotts of Japanese goods broke out in mid-September over a territorial dispute between the two governments. "Japanese brands have been handicapped by the turmoil in the relationship between Japan and China. It's very difficult for one company to see how much this is going to damage the long-term prospects of Japanese companies," Carlos Ghosn, chief executive of Nissan Motor Co (7201.T), told reporters in a year-end briefing in Tokyo. "What we know today is we are still down to last year. Obviously, the impact is reducing, (but) it's still significant...Will it go ever to zero? I don't know," he said, adding he forecasts the overall China market to grow at a similar pace to 2012. Half of a dozen senior industry executives in China expect the vehicle market grow at a single-digit pace this year, according to a recent poll conducted by an industry portal, gasgoo.com. The other half predict the market to grow by around 10 percent. John Lawler, chairman and CEO of Ford Motor's (F.N) China operations, has forecast 5 to 10 percent in the overall market, while Bob Socia, head of General Motors Co's (GM.N) China division, has said it was likely to grow by 5 to 8 percent. During the first 11 months of 2012, overall vehicle sales rose 4 percent compared with the same period a year earlier. December has traditionally been a strong month for sales so analysts predict growth for the whole of 2012 will likely be around 5 to 6 percent. The market grew 46 percent in 2009 and 32 percent in 2010, thanks mainly to government incentives that expired at the end of 2010. Growth fell to just 2.5 percent in 2011. Adding to sluggish the performance of the Japanese manufacturers, further initiatives by local governments to restrict car sales to help ease the worsening traffic gridlock is likely to weigh on the overall market. So far Beijing, Guangzhou, Shanghai and Guiyang in southwestern China have cut the number of license plates they issue. In Guangzhou, the measure, which was introduced in August, will cut annual vehicle sales by a third. "Even a small city like Guiyang did it, so I won't be surprised if other cities follow suit sooner or later," said John Zeng, Asia Pacific director for industry consultancy, LMC Automotive. Despite some headwinds, Zeng forecast passenger car sales to grow 10.2 percent in 2013, up slightly from around 7 percent as of end-November 2012. He says if it were not for the struggles of the Japanese makers, the market could grow as much as 13 percent. Optimists argue that in addition to a recovering economy and pent-up auto demand in inland cities, China's new top leadership could introduce stimulus measures to spur domestic consumption that would help boost auto demand. "There are reasons for such optimism. Whatever the market ends up with this year, I do expect an improvement of 3 to 5 percent above that," said Bill Russo, a senior adviser at Booz & Co.
China overtook the US to become the world's biggest car market in 2009. Sales in 2012 expected to exceed 19 million cars. China is set to produce more cars than Europe this year for the first time. We were joined by Bill Russo, former head of Chrysler in China and founder of Synergistics, a China business advisory firm. He joined us to discuss China's car market which is starting to grow more slowly as the nation's roads get increasingly congested. "The market is arriving at an inflection point. Post financial crisis growth was largely correlated with the growth of the urban middle class," said Mr. Russo. Try to sell anything but a small hatchback in Europe without a diesel engine and sales will be limited. But in China, barring a few SUVs and Volkswagen taxis, passenger cars are strictly petrol; only some 10,000 diesel cars were sold in 2009, according to the latest available figures. Until 1993, China was an oil exporter, but increasing demand, partially fueled by the rising number of cars, means it now has to import about half its needs. As diesel delivers better fuel economy than petrol, the China Association of Automobile Manufacturers says the government is to offer a subsidy of up to RMB5,000 to purchasers of diesel cars. vehicles on the road by 2015 looks likely to fall way short. “Alternative fuels and propulsion technologies such as plug-in hybrid electric vehicles and hybrid electric vehicles are taking much longer to develop to maturity than initially anticipated, and [diesel] could provide a stepping stone towards the longer term alternatives,” says Bill Russo, President and automotive consultant of international business consultancy Synergistics. But implementation will not be easy; diesel supplies are currently geared towards commercial vehicles and its high sulphur content doesn’t suit modern diesel cars. has an advantage over some rival Chinese manufacturers as it, along with Chery, Hawtai and SAIC, is already using diesel engines. Whether companies decide to go it alone or switch to diesel through technology-sharing with foreign manufacturing partners, the benefits are substantial. This is the second installment in a series on the China Commercial Vehicles market. Click here to read the first installment. Unlike the passenger vehicles market, domestic brand manufacturers dominate the commercial truck sector in China. Historically, the top China truck manufacturers started their MDT & HDT development from older generation platforms, which originated from the former Soviet Union and Austria (Steyr). The availability of low cost platforms, and very low freight rates (which have remained firm for the past two decades), has created a hidden cost barrier for major international players. Full-year sales in 2010 indicates that a 90% market share of MDT/HDT was taken by 10 Chinese OEMs, with First Auto Works (FAW), Dongfeng Motors (DFM) and China National Heavy Duty Truck Corp (CNHTC) in the top 3 positions for HDT. Together they have a combined market share of 58% of the MDT/HDT market. However, each OEM has distinctive positioning and advantages in the HDT segment. FAW and DFM enjoy the best brand image and have a deep commercial vehicle experience, along with a well-developed dealer and service network. However, both suffer from weak corporate governance and a lack of employee performance incentives. Both companies have developed their HDT product line-up through upgrades from their MDT platforms, and they positioned themselves as volume leaders in the medium- to low-priced HDT segment. CNHTC is considered the best competitor in the construction sector. They develop their own parts and will benefit from the JV with MAN in the area of product and component development, procurement and sales. CNHTC is weak in their portfolio of long-haul vehicles. Their company operation is considered very bureaucratic and they have a poorly-developed dealer and service network. BAIC Foton is behind the top 3 in sales, and should considerably benefit from the JV with Daimler to develop engines. Despite their smaller scale, Foton has more efficient product development, stronger marketing and a better dealer network. Shaanqi has comparable sales to BAIC Foton, and is well recognized in the vocational HDT sector. Historically, Shaanqi benefited from previous cooperation with MAN and their technology assistance. However, such advantage is being eroded when MAN forms its alliance with CNHTC. Shaanqi is also fighting with their parent company (Weichai) on operational control. Among the smaller truck makers, JAC and Beiben are most likely to close the gap with Shaanqi, since they can leverage the advanced technology supply from their international partners respectively. JAC has been discussing potential partnerships with Navistar and Caterpillar, while Beiben is cooperating with Hyundai. The rest and other new entrants, such as SAIC, CAMC and Nanjun, have a much narrower range and face several technical and financial constraints to expand their market share. China MDT/HDT manufacturers benefit from low labor and raw material costs, which enable them to sell their Vehicles at 25 – 33% of the price of international products. Prices for trucks produced by multinationals can range as high as USD $350,000 (MAN), whereas the highest priced product in China sells for 72% less at USD $100,000 (FAW). On the demand side, the government and commercial fleet demand is slowing down, and buyers are increasingly concerned with fuel economy and durability. Further complicating the landscape is the fact that more stringent regulations regarding safety and environmental standards are being implemented – driving cost structure higher. On the supply side, the technology and feature gap among local manufacturers is narrowing. It is becoming increasingly difficult to charge any price premium on new vehicles as the market has become hyper-competitive and less differentiated. Those challenges are pushing local brands to alter their thinking regarding the need for development and technology support from international partners. With the gates to China’s commercial truck market potentially beginning to open, leading HDT manufacturers have begun to explore joint ventures and alliances in China with top-tier manufacturers. Various joint venture and equity shareholding relationships were established since the SAIC Iveco successfully formed its JV with Chongqing Hongyan in 2006. The cooperation between MAN/CNHTC offers perhaps the most promising cooperation, as the interests of both parties are apparently well aligned. The strategy includes formation of an R&D center and involves a global strategy including direct exports to the EU. The Daimler/BAIC-Foton JV entails a strong technology component and a solid market component. The Iveco/SAIC cooperation has been in place for several years and provides a limited rage of products for the domestic market. Navistar/JAC have more recently discussed a potential cooperation for the China domestic market, and Volvo Truck is in active talks with Dongfeng Motor to form a HDT joint venture after ending their cooperation with CNHTC. This JV is expected to be majority (55%) controlled by Dongfeng, and may involve building a locally-branded HDT based off a European standard cab and chassis supplied by Volvo. Expanded cooperation between domestic manufacturers and international players will reshape the landscape of China’s HDT market. The market can be broken down into three price segments: Low-end (less than 200,000 RMB, e.g. 32,000 USD), Mid-market (200,000-350,000 RMB, e.g. 32,000-55,000 USD) and High-end/imported segment (above 350,000 RMB). Among which, the mid-market segment is more than 70%, and being continually enlarged by virtue of the continuous upgrading of locally built trucks. The mid-market HDT segment is different from the low-end product segment, not only by pricing, but also by vehicle capacity and sophistication of technologies. Mid-market HDT is characterized as higher gross weight (18 tons and above), higher power output (range from 230HP-420HP), and more advanced safety and fuel economy technologies. Two paths are followed by Chinese truck manufacturers for obtaining such technologies. Independent development on the inherited vehicle platform is one approach. The Jiefang brand J6 developed by FAW is one good example. However, J6 was a cost- and time-intensive project for FAW, which spent a total of seven years and invested more than USD $100 million . As an alternative, China local manufacturers are choosing to collaborate with international partners to locally adapt their existing global platforms to the Chinese market requirements. Starting with the initial cooperation between MAN and Shannaqi on the F2000 platform in 2004, other collaborative partnerships have followed. Dongfeng worked with Nissan Diesel on development of the Tianlong series, CNHTC developed its Howo A7 based off the F10 cab from Volvo, and BAIC Foton is planning to use a Mercedes-Benz diesel engine to power their Auman trucks. These locally adapted international technologies are widely welcomed by Chinese customers as “best value” products since they outperform low-end trucks while retaining a huge price advantage over the high-end/imported trucks. Obviously strong demand for mid-market products is motivating Chinese truck manufacturers to turn to international partners for technology and shared investment. With the market slow-down since 2011, many truck manufacturers are becoming concerned that they may have been overly aggressive regarding their growth prospects. Overcapacity in China will be an issue for the years to come. The forecasted demand for HDT in 2015 stands at 1.5 million units, whereas capacity will likely exceed 2 million units. Existing OEMs have ambitious expansion plans, and new entrants are also considering expanding their business into the HD truck market. To overcome the overcapacity problem, leading Chinese truck manufacturers are considering aggressive export strategies, particularly to Africa, South America and South East Asia and other countries with low emission standards, low tariffs and weak domestic truck competition. What gives Chinese OEMs the confidence to expand the truck export business is their low-price, “good enough” quality Chinese supply base. Competitive parts sourcing cost in China has the potential to change the global competitive landscape for commercial vehicles. Already today, China accounts for 50% of the global MDT/HDT market, with localized suppliers. In summary, the China MDT/HDT market is almost fully dominated by domestic truck manufacturers led by FAW, DFM and CNHTC. The competitive landscape will be altered when Chinese OEMs pursue partnerships designed to upgrade their capabilities to address growing market needs for better value HDT products. China with its unique business environment (enormous size, fiercely competitive companies, low labor costs, and explosive growth in infrastructure and public service), gives this new global mid-market players an enormous platform to grow and to improve their quality and reliability, largely protected from foreign competitors, who find it hard to penetrate this segment and focus on the high-end market. In addition the new innovators will be fully attuned to the Chinese needs, particularly in the B2B area, which will make them very competitive in other emerging markets. This is the second installment in a series on the China Commercial Vehicles market. Click here to read the third installment.